Dark Associations by Marie Sutro – Book Review. New crime debut. I’m no stranger to literary blood and gore. While I would draw the line at saying I love it, it does tend to feature highly in my reading list. 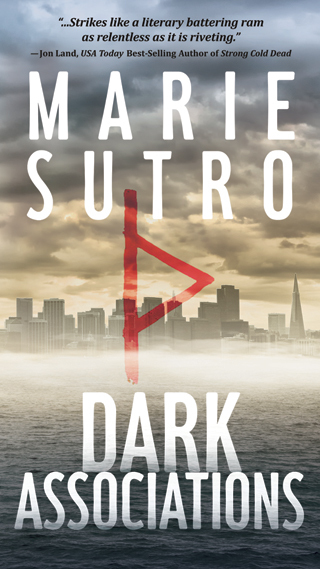 As a result, I tend to think I’m well prepared for anything an author can throw at me, but even I was shocked by the level of graphic violence in Marie Sutro’s crime novel Dark Associations. But is it gratuitous, I ask myself? That’s a difficult question to answer. I would suggest that in places she could be accused of that, but in others, it’s completely necessary for her to reveal the hideous acts her killer carries out, in order to convey the desperation and panic her lead detective, Kate Barnes, feels as she hunts the villain down. Barnes is one of those characters we’re rather familiar with. A detective with the SFPD, she had a hideous childhood, feels guilt about a loved one, and is disastrous at personal relationships. Yep, we’ve seen her like before a hundred times. But there is something compelling about her as a character – despite the clichés, she does come across as a 3-dimensional person, and one imagines her continuing in a series for years to come. Hopefully, Sutro plans to develop aspects of her personality as the books pass by. Barnes is on the trail of a serial killer dubbed The Tower Torturer due to his predilection for killing women using the kind of medieval torture methods that could have been used by jailers at the Tower of London. He’s been dormant for years but is back in circulation again, and this time it’s personal – he’s bumping off females Barnes knows. She’s helped in her investigation by a super-slick FBI agent and her regular cop partner, both of whom she’s either bedded or is about to jump in the sack with, despite her fear of relationships. I did work out who the killer was before the end, but how she catches him is intriguing stuff, so I’m not sure that matters. There’s a character twist that could enable Barnes to develop a Clarice Starling-Hannibal Lecter-style partnership if the novel does indeed turn out to be the first in a series. Whether fans of The Silence of the Lambs and the other books in Thomas Harris’ franchise would accuse Sutro of being a copycat remains to be seen. Sutro comes from a family of cops, so one imagines her technical details are correct. But where she gets the inspiration for those grisly deaths is anybody’s guess.